While we may envy the interiors of homes that are very ‘now’, a few years down the line they’re outdated, reminders of a past fad. Most of us can’t afford a remodel every handful of years, so a wise, but also attractive option, is to go with a stylish yet also timeless design. That would be the classic style. A classic interior does not however have to be boring. Far from it, in fact. There are all sorts of interesting twists and traits of individual personality that you can inject into a stylish base. But you stick to the basics with your framework, then ‘fill it in’ with modern or unconventional touches that can be easily switched out when wanting to update the look. So what are the classic framework elements? These are columns, plinths, tone-on-tone stripes, statues, and the liberal use of architectural mouldings like cornices (sometimes called coves), architraves, skirting boards, crown mouldings, and ceiling roses. Mouldings can be functional and/or decorative; a functional moulding might be a cornice, which conceals the connection between a ceiling and wall, while a decorative moulding might be dado rail. Mouldings offer an attractive profile to a surface or space. Classic mouldings offer a room a sense of historic charm. The more decorative the moulding, the more dated the look, so you want to go with something understated to keep it timeless. 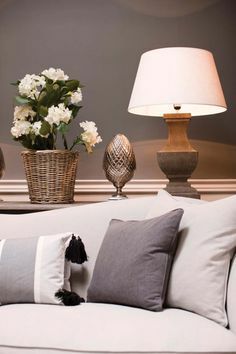 Think simple curves and stripes rather than floral or patterned mouldings. As the name suggests, classic interiors derive their inspiration from the Greeks and Romans, who were all about balance, focal points, and symmetry always. So a fireplace, large mirror, central staircase or the like will often form the focal point. They will then have furniture and objects positioned around them in such a way as to show the former’s dominance in the tableau. This will often mean two matching chairs or couches being positioned one on either side of the fireplace, thereby achieving symmetry and balance. Symmetry is also often brought in through matching stands, side tables or busts on pedestals. While symmetry is common, the most important ingredient is balance. The classic room needs traditional proportioning and scale. Avoid for example the overstuffed couches of the cottage look, the large open spaces of minimalism, the higgledy-piggledy arrangements of eclecticism, and the oversized art of modernism. When it comes to choosing furniture and accessories for the classic room, note that a few carefully chosen antiques or traditional items can work well to provide a sense of history. What keeps them turning the room into a traditional one is that they are used in conjunction with the clean, timeless elements of classicism. Classic interiors make use of natural or ‘classic’ materials like stone, wood, marble, brick, canvas and cotton. These materials help to establish an ageless feel. Formica and other modern concoctions have little place in classic interiors. As to colours, since classic interiors don’t aim to be showy or loud neutrals tend to be used. Common wall colours are off-white, beige, taupe, and grey. They set a muted, restful tone. Alternatively, black and dark colours like navy and pine can be used. Architectural mouldings and ceilings are then often painted in pure white to offset the wall paint. Classic interiors eschew frills, embellishments, and fuss; there’s nothing ‘silly’ about them. Their primary aims are function and comfort. And this is what helps them to achieve lasting appeal. For example, you won’t have an oversized kitchen sink as that’s not practical and you won’t have spindly chairs as those aren’t inviting. What you will have is space enough to move around easily, comfortable seating, reasonable surface space, and sufficient storage, shelves, rails and hooks. At the end of the day the classic room will be sophisticated and poised. The framework of that interior will be understated and adaptable, and can be seen as the canvas on which to paint numerous different pictures. By embracing the classic basics, you will create timeless interiors that will make your home a true haven from the world.